For children who have adverse childhood experiences (ACEs), co-regulation is at the heart of teaching—and of discipline. These children need assistance regulating their nervous system before they can learn new coping strategies and understand the consequences of their choices and decisions. We don’t hesitate to teach our students the reading or math skills they need to be successful, and emotional and behavioral skills should be no different. Students with ACEs may come to school having little experience with impulse control and emotional regulation. They may struggle with paying attention. These are executive function skill sets our students need to be academically, socially, and emotionally successful. The strategies described here are Tier One strategies in a Response to Intervention model for discipline and engagement. Co-regulation is beneficial for all students, and these brain-aligned preventative strategies aid all students in regulating their responses and developing relationships. They can be a part of our procedures, routines, morning meetings, and bell work, easing all transitions throughout the day. 1. Incorporate rhythm. Our hearts beat in rhythms, we sleep and live in rhythms, and our breath has a cadence that can regulate our nervous systems. When these rhythms are missing, our sensory and motor systems can be compromised. At the center where I work, we model rocking movements before rest or naptime or during transitions. Children follow the teachers as we sway back and forth to soft music or to the sound of a quiet voice. These rocking exercises help the children quiet down and refocus or prepare for quiet time. We also bring in rhythm by having the children mimic the pattern set by a leader using paint sticks or drumsticks. We can vary this drumming from soft to loud, slow to fast, and even move our bodies as we drum together. Children can also listen to the beat of a piece of music and use crayons to draw how they visualize and imagine the beat with colors and shapes of different sizes. 2. Have students take a sensory bath. This is a class favorite. In the mornings, we gather a group of three or four children in one area of the room with their own bath loofahs, a large beach towel, and a tube of lotion. Students can take their loofah and press on their arms and legs, pretending to scrub and clean, or they can choose an adult to give the sensory bath. I model this activity by pretending to step into a tub. Then we sit down and sing, “We’re taking a brain bath, a brain bath, a brain bath, / We’re taking a brain bath to help us feel _____,” and students choose different words to fill in a sensation or feeling: happy, bubbly, fresh, clean, peaceful, etc. Once we pat the loofah up and down our arms and legs, we pretend to carefully step out of the tub. One at a time, we wrap each child tightly in the beach towel while rocking back and forth or side to side and continuing to sing. This time we sing about drying off and feeling ready for the day. Students can then opt to get a drop of hand lotion to massage on their hands before leaving the area with three deep breaths as they enter their day of learning. Addressing the sensory and motor systems of these young children helps them regulate their nervous system so learning can occur. 3. Use a singing bowl. Patterned, repetitive activity that works with our body’s rhythms and senses is calming to a child’s nervous system. The Tibetan singing bowl is a part of our morning circle time—students listen to the sound the bowl creates and we collectively try to match that sound. We follow this with three deep breaths and then take turns playing the bowl, matching the sound and increasing our breaths to five or six long inhales and exhales. Sometimes we play the bowl and students close their eyes and listen to the tone until they can’t hear it any longer. When this happens, they raise their hands in the air. 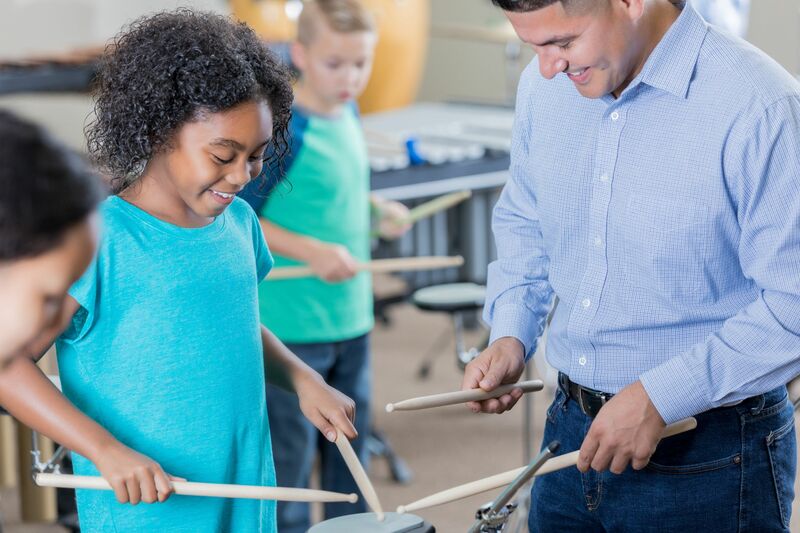 Some children may be sensitive to these sounds, so it’s important to pay close attention to each child’s response and adjust this activity as needed. 4. Walk the lines. Movement and breath calm the nervous system. We’ve created an adjustable labyrinth of colorful lines, shapes, and mazes with various types of foot work and animal walks that the children follow—walking, hopping, crawling, or skipping as indicated. We model the crab walk along the purple line, for example, and then the students follow. The students love to lead this exercise and often design patterns of movement that we mimic. This regulation strategy gives us a deep look into students’ balance and gross and fine motor skills. We’re also able to see their levels of frustration and how they respond to mistakes by redirecting their movements.